The retailer's business model and its sought-after outerwear are both contributing to impressive results. The company surprised investors with results that surpassed expectations on multiple fronts. Revenue soared 41% year over year to $403.8 million (Canadian dollars), while gross margin improved more than 600 basis points to 58.8%. What's behind these numbers and investors' extreme bullishness on this Canadian manufacturer of luxe winter outerwear? Below, we'll look at three key themes that illuminate the organization's current success. 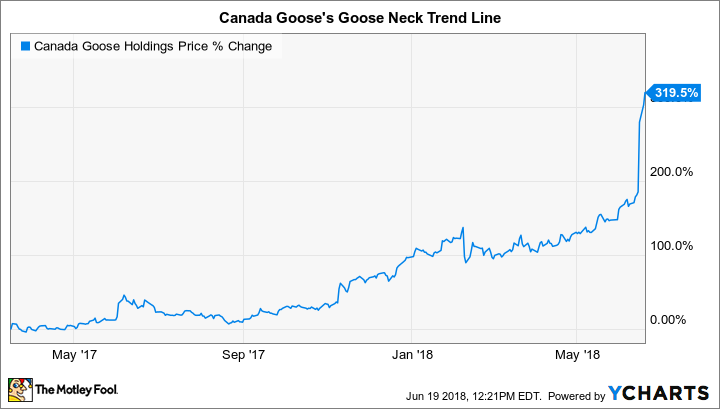 While Canada Goose built its brand in the wholesale channel, its overriding priority since its entry into the public markets in March 2017 has been the expansion of its direct-to-consumer, or DTC, channel. Last fall, I discussed Canada Goose's dual "clicks and bricks" DTC strategy with my colleague Vincent Shen. The clicks portion of this strategy consists of a gradual rollout of country-specific e-commerce websites. The company has 12 such sites, and outside of the North American market of Canada and the U.S., the balance of online stores is primarily in western European countries. The bricks component includes seven retail flagship stores that the company has opened over the last two years, in Toronto, Calgary, Boston, New York, Chicago, London, and Tokyo. Choosing to enter the cutthroat world of physical retail makes sense for an organization like Canada Goose, which sells rugged outerwear at luxury price points: Many parka models reach well over $1,000 in price. The click-and-brick approach yielded a stunning DTC segment revenue growth rate of 121% in the fourth quarter; sales jumped from $115.2 million in the prior year to $255.0 million. For a brand with enviable cachet, Canada Goose still has much potential for expansion in this channel. The company recently announced its next significant DTC foray, an entry into the China market, which will include an online store on Alibaba's Tmall e-commerce platform, the opening of a regional headquarters in Shanghai, and two new flagship stores to be launched in Beijing and Hong Kong. During Canada Goose's fourth-quarter earnings conference call, CEO Dani Reiss elaborated on the new stores, which the company will launch with a local partner, ImagineX, a subsidiary of successful Chinese luxury department store Lane Crawford. Reiss noted that ImagineX will manage the two locations and receive fee-based compensation tied to sales volumes. He also stressed the benefit of using a local partner with deep expertise to plunge into the Chinese market with momentum. Canada Goose maintains a philosophy of maximizing in-house production, as value-added goods typically carry a higher margin than those that are outsourced. As earnings were released on June 15, Canada Goose announced that it plans to open its seventh production facility, its third location in Winnipeg, Canada. According to Reiss, the facility will be built over the following three years in two phases, and once complete, it will boast the capability of producing all the company's down-filled jackets on-site. The Winnipeg production site is part of a specific objective to increase in-house production from one-third of all goods to one-half within the coming years. As I've recently discussed, Canada Goose has increased its manufacturing base by more than 50% in the last year, to 2,000 employees. This steady investment in manufacturing capability is somewhat atypical for a relatively small luxury goods company, but it ensures that Canada Goose can control the quality of its product in the near term. The capacity expansion also means that the company will likely be able to meet rising demand as it builds out both the e-commerce and physical flagship components of its DTC segment. On the company's earnings call, CFO John Black noted that the overall gross margin increase of roughly six percentage points versus the prior-year quarter was due to a higher proportion of DTC revenue versus wholesale revenue in the overall revenue mix. However, DTC gross margin compared to the prior-year quarter actually declined by roughly one percentage point, to 74.4%. This was attributed to seasonal product mix as the company sold more lighter-weight, lower-margin jackets during the last three months. Nonetheless, Black pointed out that Canada Goose benefited from "incremental gross margin dollars." In other words, though it sold a less profitable assortment of clothes, these were still in high demand even during the off-peak spring season, thus, the company achieved extremely high volumes. While gross profit margin declined, the absolute amount of gross profit in dollar terms of $78.2 million well exceeded last year's comparable number of $27.8 million. So, for the moment, Canada Goose is enjoying the most amenable of environments thanks to its sought-after products. The company is posting double-digit revenue gains on high-margin products during fall and winter and following this up with commensurately active sales on lighter outerwear during the off months. If anything, the current-year forecast, which was released last week and projects revenue growth of at least 20% in fiscal 2019, seems conservative.